Hi all - I really love this card! The idea has come from a couple of different areas. 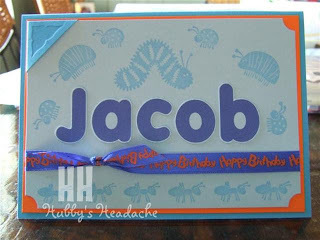 I just love the bold name with the bugs (sister-in-law cased the idea off the internet - SCS I think) It is a wonderful idea for children as they really love to see their name on their card. The cute little magnifing glass idea is taken from a card we made at one of Karen's workshops (my upline) - thanks Karen. I think that it finished this card off nicely! 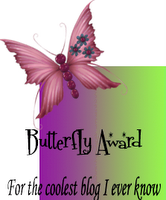 This was the first one I made after seeing the bold letter and bug idea. This one I had printed the letters out on the computer and then cut them out. I didn't have the lettering at the time and I think it came up just as nice doing it that way. I went with this colour scheme of blue and orange because of the ribbon which I wanted to use. I love those two colours together for a boy. Fabulous bug cards Debbie. I like the blue and orange too. 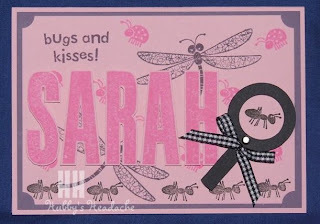 Great 'bug' cards Deb! I have this stamp set on my wish list, it gets longer and longer lol!